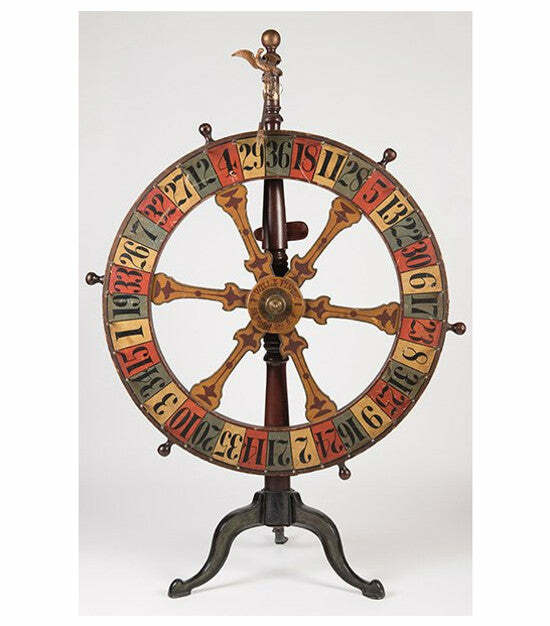 A circa 1900 gambling wheel by San Francisco based maker Will & Finck is to sell at Potter & Potter Auctions. The lot is valued at $12,000-15,000 ahead of a May 21 sale of gambling related items in Chicago. It's made from walnut and brass, and stands on a set of cast iron legs. The wheel itself is exceptionally well-preserved. This is the only example built by the company ever to surface and is believed to be unique. It features two weights on the back, indicating an attempt by an unscrupulous house to rig the game. Will & Finck is best known as a metalworker, and produced knives and other items for workers during the California Gold Rush. A rare set of 1865 Dougherty Army and Navy civil war playing cards is valued at $7,000-10,000. Rather than the standard suits, the cards are separated into Merrimacks, Monitors, Soaves and Drummers. The former two represent the navy (being early US armoured ships) while the latter represent the army. The Ace of Monitors bears the inscription: "To Commemorate the Greatest Event in Naval History. The Substitution of Iron for Wood." Love antiques? Click here to take a look at our fascinating selection. Please sign up to our free newsletter to receive exciting news about antique auctions.